Grooming your guinea pig isn't just a way to bond with your little pet. It's also a way to inspect his hair and skin regularly to make sure both are in good condition. If you spot a skin problem on your cavy, take him to the vet as soon as possible for diagnosis and treatment. Nipping it in the bud can save your guinea pig from pain and infection. Fungal skin infections more often affect young or very stressed cavies, according to the Merck Veterinary Manual. Among the most common is ringworm, which isn't a worm but a fungus. Symptoms include hair loss and crusty lesions, usually occurring on the face. Ringworm can also spread to your guinea pig's back. These lesions can become infected, with abscesses erupting on the skin. Your vet will prescribe oral and topical antifungal medications to clear up the condition. 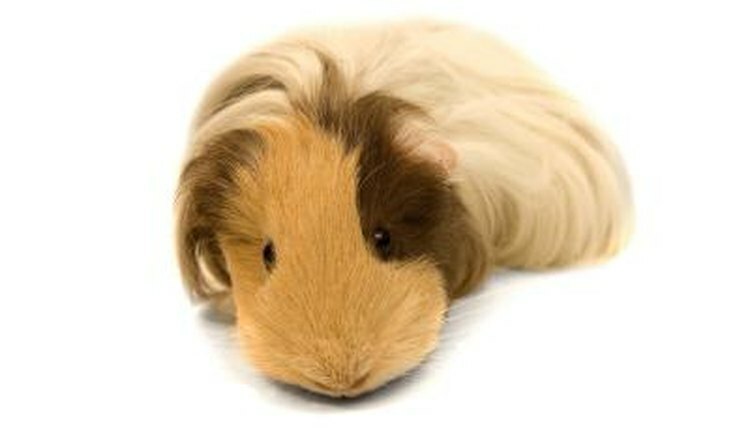 Your guinea pig could become infested with fur mites or lice. Most guinea pigs have mites living on their skin, but it doesn't become an issue unless your cavy becomes ill or stressed, weakening his immune system. Signs of fur mites include hair loss, itching and skin lesions. You'll most likely see irritation along your pet's abdomen, neck and shoulders. In a worst-case scenario, the infestation becomes so overwhelming that the guinea pig experiences seizures. More rarely, lice infest cavies. Your vet takes a skin scraping to determine the type of parasite, then prescribes a topical medication to get rid of the parasites or injects medication to treat inflammation or infection. Since these parasites are so contagious, any cavies sharing your pet's cage must also be treated. Check your guinea pig's feet regularly for signs of bumblefoot, technically known as pododermatitis. Your pet's footpads become infected with the bacteria Staphylococcus aureus, often from small cuts or abrasions. What begins as a small red spot soon blossoms into large, infected sores if left untreated. If your pet lives in a cage with wire flooring with no non-wired areas, bumblefoot is more likely to occur. Your vet will clean the wounds and prescribe medication. Serious infections might require foot amputation. You might feel lumps on your guinea pig's skin while petting or brushing him. A lump could result from a infected wound, causing an abscess or pus pocket. It could also mean your pet has a tumor, either benign or malignant. Take your pet to the vet for a diagnosis and treatment. An ounce of prevention is worth a pound of cure -- and potentially hundreds of dollars in vet bills. To help prevent skin problems in your guinea pig, keep his cage very clean, changing bedding frequently. If he's in a wire cage, make sure a sufficient smooth area exists for him to rest on. Keep your pet in the driest, least-humid part of the house. Feed your cavy a veterinarian-recommended high-quality diet. Because guinea pigs can't produce their own vitamin C, make sure yours has a supplement in his cage.